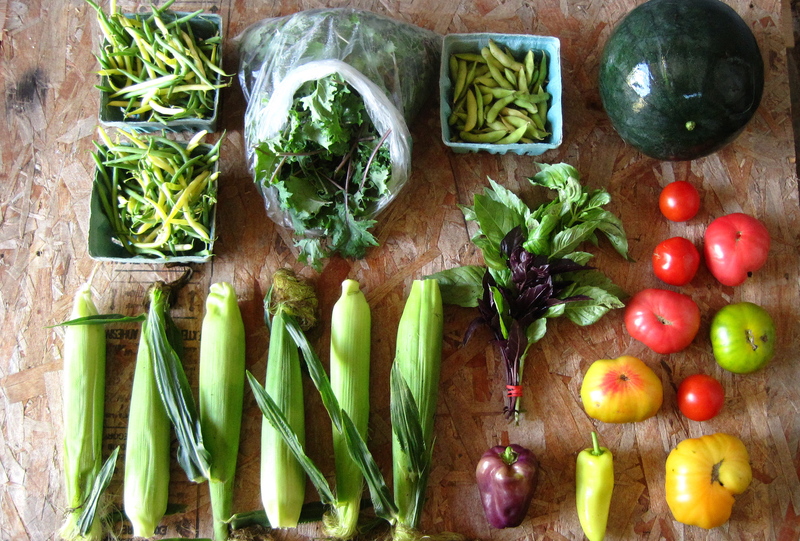 We hope this week finds you well-rested after a holiday weekend and ready for more abundant produce! 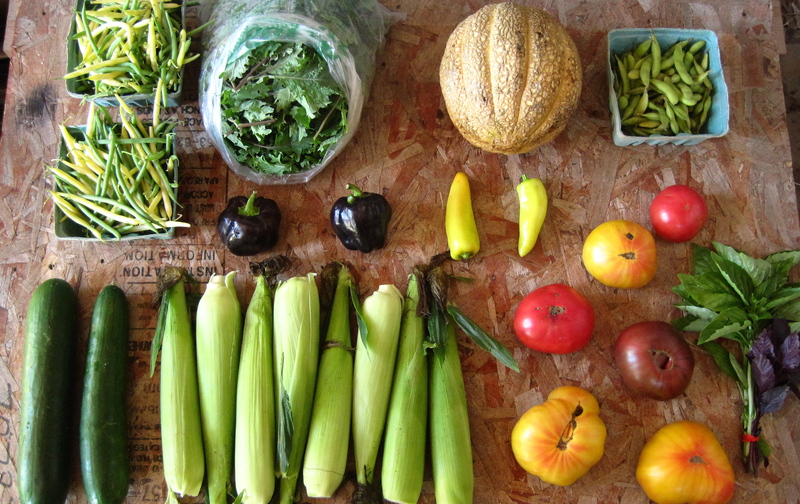 Even though labor day signals the end of summer and the beginning of fall, we are still in the lovely throes of lots of corn, beans, tomatoes and basil. The boxes are full and fun, and now that we’ve got a friend and neighbor farmer helping out once a week, our Monday harvest day is a lot more humane. Thanks, Ben! It’s time for our annual member gathering, and we think the fall will be a fantastic time for one this year! We have set the date for Sunday, October 5th, from 10 am to 4 pm. Our plan is to all work together to bring in the fall harvest for the first half of the day, and then enjoy a big potluck and farm fun for the second half of the day, with plenty of time included for guided tours and self-exploration. Please feel free to join us for all or part of the day-we’d love to see you whether or not you can help haul in the winter squash and fall root crops in the morning. We’ve set the potluck lunch-time for 1:30 pm. If you plan to attend, please RSVP via email to sleepyrootfarm@gmail.com so we can plan accordingly. We hope to see lots of you there! Member gatherings are a really important way for us to build our Sleepy Root community, and you all are so important to us! We’d love to be able to see you and thank you in person. 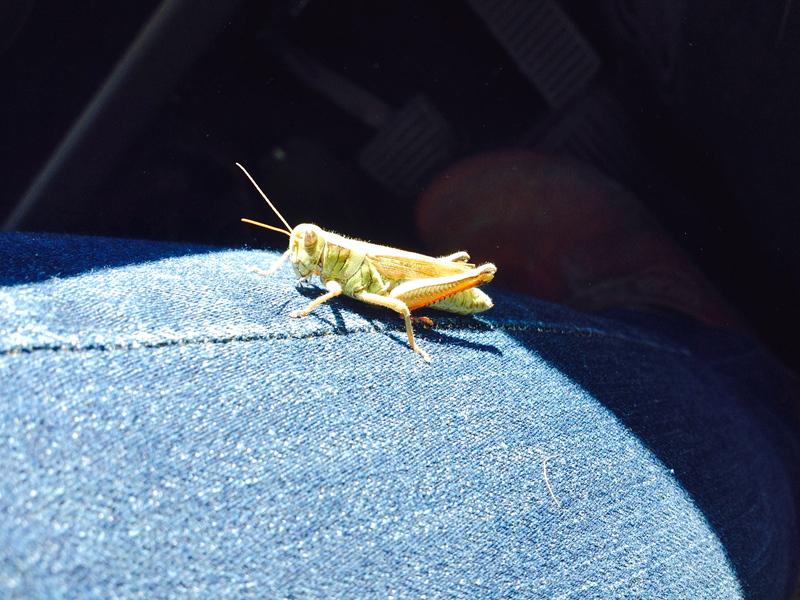 We’ve never seen so many grasshoppers in a season! This little guy hitched a ride in the truck with us. 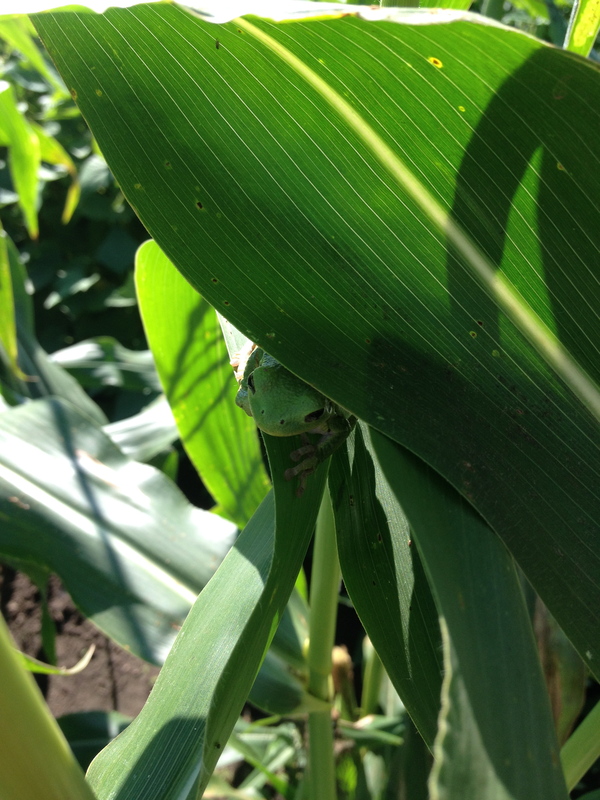 Brandon found this little beauty in the corn. Everyone is receiving melons again this week, we hope you are enjoying them. The crop is doing well and Brandon is happy that his prophecy that 2014 is the year of the melon has come true! 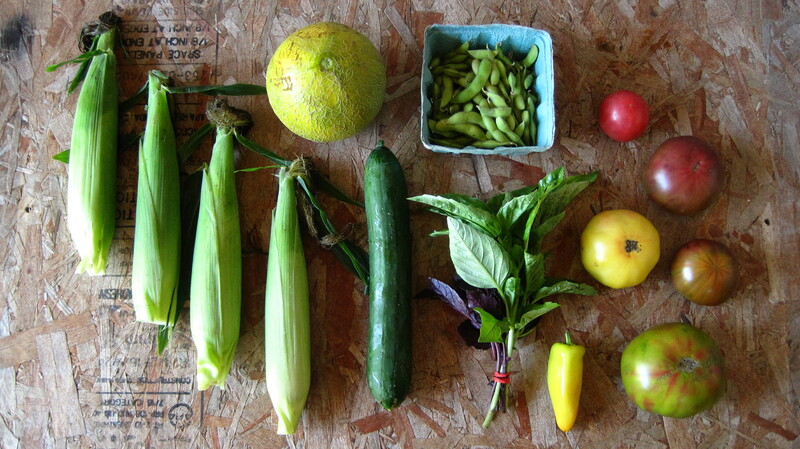 All members are getting a good amount of corn, tomatoes and basil again. We’re sure that you’re all coming up with great ways to use these summertime treats, if you have a great recipe send it on to us so we can share with the whole Sleepy Root family. A special treat for everyone this week is a little baggie of Edamame. These are fresh soybeans, and a staple of most Sushi restaurants. Don’t let their weird shape and hairy pod scare you, they taste great and were a big hit at our employee meal on Monday. They are a great little appetizer! See method for eating below. Another fun item in the boxes is baby kale. We plant these seeds densely, the same way we plant our lettuce beds, and harvest them in the same manner as well. We love having smaller, cut greens year-round but lettuces grown in our region this time of year tend to be aggressively bitter. Baby kale is a super-nutritious, tasty and gorgeous alternative. Eat this fresh and raw like you would any other baby lettuce mix, or feel free to saute or stir fry it like you would full-grown kale. Haricots verts are back! These gorgeous, slender yellow and green French beans are delicate and tasty. A staple of fine dining, they rarely show up on the commercial market because they need to be harvested by hand and take quite a while to pick. 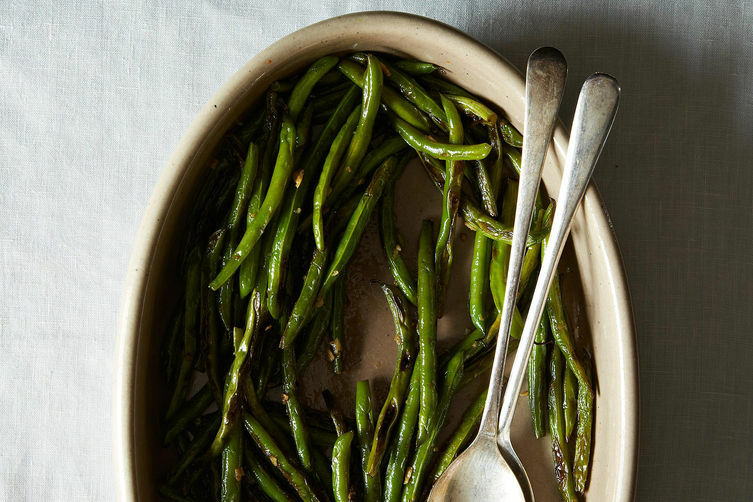 Treat them like you would any green bean, and just appreciate how tender they are to eat. We’ve got a few recipes below for you to try. Steam edamame in their pods for about 10 minutes, or until the beans are tender when you slip one out of the pod to sample. 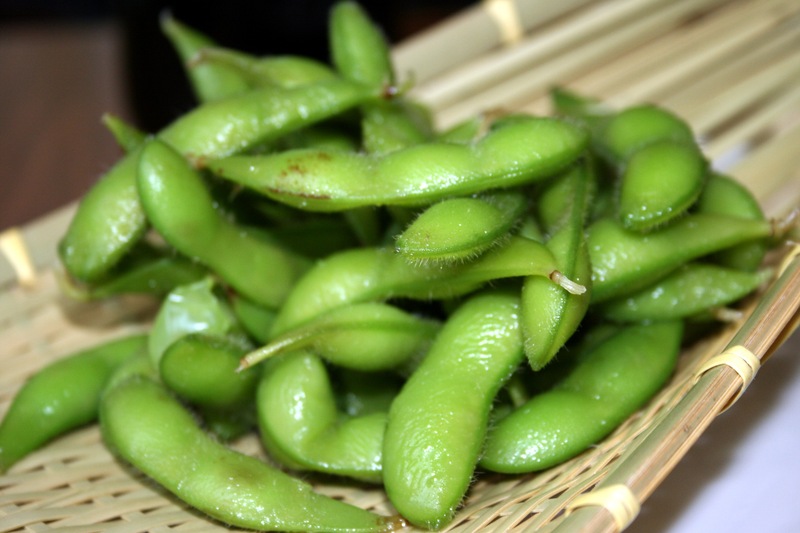 Place the edamame in a bowl, toss with sesame oil, and sprinkle with salt. Place an empty bowl on the table as well, for people to put their discarded pods into. To eat, simply slip the beans out of the pods with your fingers, or for even more fun, place the pod in your mouth, holding on to the tip, and pull between your teeth. The beans will slide out, and you’ll have a tasty bean treat with the seasoning of the sesame oil and salt. Discard pod and repeat. Author Notes: This technique looks embarrassingly simple, and it is. But it shakes up our habits, and with four ingredients, lets green beans become their best selves. Resist the temptation to add liquid. The beans will stew in their own juices, and their flavor will be completely undiluted. You could leave the garlic out, but its pushy sting will soften a little on the warmth of the beans. Adapted from The Foods and Wines of Spain (Knopf, 1982). Snap off the tops of the beans. Melt the butter in a skillet, add the beans, and cook them over a medium to medium-high flame, stirring, until they begin to brown. Lower the flame, cover, and cook 15 to 20 minutes, or until the beans are the desired tenderness, stirring occasionally. Mix in the crushed garlic, sprinkle with salt, and serve immediately. STEP 1-Bring a large saucepan of water to a boil. Prepare an ice-water bath. Addsalt to boiling water, then add haricots verts; cook just until beans are bright green all over, 1 to 2 minutes. STEP 2-Drain beans; rinse immediately with cold water. Transfer to ice-water bath. When chilled completely, drain; pat dry. STEP 3-Put shallot and vinegar in a small bowl; season with salt and pepper. Let stand 15 minutes. Whisk in mustard. Whisking constantly, pour in oil in a slow, steady stream until emulsified. Set aside until ready to dress beans; whisk before using. Brandon, Heather, baby Root, and Frank!